Photo by Stephen De Ropp. The absence of Julie Roth, former administrative assistant and sports information coordinator, left UC Santa Cruz Athletics in a tailspin trying to cover all the work she did. Collin Pregliasco, the new associate athletic director, will do his part to help calm the storm. He began at UCSC on Nov. 9 with some day-to-day work like game management and handling of the university sports’ teams. If he is to fill Roth’s shoes, however, added pressure is soon to come. 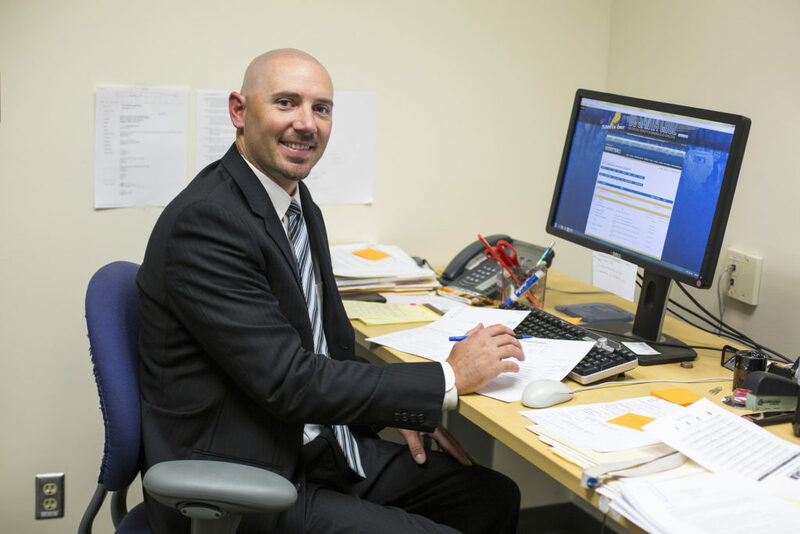 Out of more than 25 applicants, Pregliasco stood out to the hiring staff because of his experience in sports information, compliance and coaching. He was previously an assistant athletic director and kinesiology instructor at Foothill City College in Los Altos Hills, California. The athletic department suffered for almost three months without anyone in this position, forcing other staff members to take on tasks they hadn’t handled before. People around the department have pitched in by following up with NCAA paperwork, marketing pieces and media relations. Marcus Wirth, assistant athletic director for event management, took over scheduling and contact work while Lela Vasquez, director of financial operations, ran the search committee that led to Pregliasco’s hiring. The turnaround was quick for Pregliasco, as Roth left after she ensured all of the UCSC NCAA teams were eligible to compete this August. Roth, who now works as an administrator for Facebook, left UCSC after nine years as the lone sports information director, a position that encompasses multiple positions at almost any other university. Cal Lutheran University, a NCAA Division III opponent, has two assistant athletic directors, one sports information director and one athletic director. Roth took on the workload of these four positions. The torch has been passed to Pregliasco in hopes that he can handle a portion of the load Roth did so well, like checking on the student-athletes classes, following up with their grades, official paperwork, learning and working with the faculty athletic staff. Pregliasco is ready for the challenge.